Precisely to the point, there's Bobby Womack, age 66, a devoted seasoned ticket holder, whose fascination with sports dates back to the 1960s in Woodbury's venerable Veterans Memorial Gymnasium. "Have a road game, no problem, Bobby will travel," confirms Woodbury Mayor Harold Patrick, himself a loyal rooter of Lions/Lionettes' sports, dating back to when Patrick was the "Voice of the Lions" on WBRY Radio. "Our girls and boys are having great seasons, they deserve our support," Womack was overheard "preaching" to the gathering of sports fans who regularly hang out at Parsley's Grocery. "In last month's sub-freezing temperature, for example, I looked up in the stands, and Bobby Womack was there, rooting for the boy Lions' team," added Patrick. "And the game was in Sparta … on some icy roads." "Not only does Bobby attend games, he recruits other fans to be in the stands to cheer for the Lions," added the mayor. "And Bobby was a great athlete in his own playing days." Cannon High graduate Ed Sissom recalls Womack's prowess and power on the football field. "I was a high school sophomore when I first noticed Bobby Womack," Sissom detailed. "But he was not the traditional punter, for Bobby kicked the ball barefooted. And he kicked with his left foot, which made him that much more unique. He had power in his kicking." 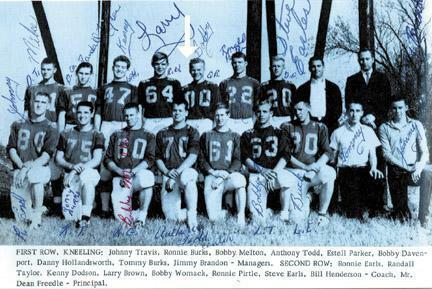 Auburntown High School graduate Randy King goes back to the days Womack starred in football and basketball at the high school in Woodbury. "Bobby was very good at kicking the football, and could throw the football with the best of them," added Murfreesboro resident King. King knows about sports, since he's scheduled April 5 for induction into the Tennessee Sports Hall of Fame for his achievements as basketball coach at Murfreesboro's Oakland High School. However, Womack achieved his sports star status despite a handicap. "Bobby would have been one of the best athletes this county ever saw, if he had two good legs," reported Andy Bryson, former publisher of the Cannon Courier newspaper in Woodbury who played sports with Womack. "But, Bobby never let his problem slow him down in anything he attempted in life. I believe it made him more determined to succeed. And he has succeeded in all aspects of life." Bryson and Womack played softball on men's teams after respective high school days. "If you didn't know about Bobby's leg problem, you'd never have noticed it on the football field or on the basketball court," Mayor Patrick added. "He was one of the best athletes, played multiple sports and was one of the most popular students to ever walk the halls of Cannon County High School." Many people today mistakenly think Womack had polio as a child. "I was born with a club foot, without the traditional big ligament and muscle behind the ankle on my left leg," Womack diagnosed. "Ironically, that's the leg and foot I kicked the football (barefooted) with." So severe was his foot and leg condition, a Woodbury physician did surgery within days of Bobby being born the son of the late Aubrey and Mahalia Alexander Womack in 1947. "I was only 10 days old, when legendary Dr. J.F. Adams performed surgery on me," Womack shared. "I can't recall how many surgeries I had all through grammar school. After surgery, they put a hard cast on my leg that I wore through the hot summers. "When school would start back, they'd remove the cast, and put me in a brace," Womack stepped back in time. "I recently ran into a man who recalled hearing me 'squeak' as I'd go down the oil-covered floors at Woodbury Grammar School." We're describing serious pain that Womack experienced as a child. "They performed multiple surgeries, in attempting to get my left foot to point forward," Womack described. "They'd clip another section of tendon to help straighten my left leg. "I can't recall how many surgeries, for some of them came when I was very young," Womack said. He shared about ending the series of surgeries. "I didn't mind the surgery itself, but the ether would make me sick for a week to 10 days," Womack accounted. "And being laid up for the summers was tough. "At night, I'd try to sleep while wearing high-top corrective shoes, with a two-foot steel bar between my feet, which forced my left foot to point forward," Womack recalled. "I'd have to holler out during the night for Mother to come and turn me over, so maybe I could go back to sleep." He gives a lot of credit to his mother and a devoted aunt. "I vividly recall my aunt, Betty Sue Smith, being devoted to help me and Mother," Womack recalled. "They'd place me in our old 1948 Chevy, and carry me back and forth to Nashville, where I'd have more corrective surgeries on my leg … can't say enough good for my Aunt Betty Sue!" After doctors and family nurtured his problem leg and foot to face forward, Womack took to sports. "I never considered not playing sports," Womack detailed. "I made the football team as a sophomore. When I became quarterback in the 11th grade, we had Larry Brown as our running back. And Johnny Travis was our receiver on passing plays." He achieved captain status on the football Lions. But, it was after high school, as an adult that Womack most frequently made headlines on area sports pages in Nashville, Murfreesboro and Woodbury. "I loved playing baseball and softball," Womack noted. "I was a first baseman when I played for softball teams such as International Kar Kare, Chromalox and for State Farm Insurance in Murfreesboro. We travelled all over the Southeast, that's how good some of our teams were." He could hit with power too. "I hit five homeruns in a three-game playoff series one day, when we played softball for the Mel Adams State Farm Insurance team," Womack recalls. "We played that day at old Grantland Rice Field in Murfreesboro." Womack never complained publicly about his leg problem. "Bobby never talked about his handicap, never used it as an excuse," King confirmed. "And he could hit with power. He was an unselfish ballplayer … would sacrifice when that was needed, or hit to the opposite field … do anything to help the team. "Any ball thrown in his proximity around first base, Bobby had good hands, and would catch it," added King. "Bobby was an all-around great athlete," King crowned. "He's never let a handicap hold him back in life or on the ball field." Excellent story about an exceptional person!